Hadleigh Park is a stunning venue in Essex. The picturesque country park contains idyllic countryside, magnificent views, important historical sites and one of the UK’s top mountain biking courses. This world-class sporting venue boasts a huge network of bike trails alongside a large car park, café, and children’s play area. Why not experience this stunning venue for yourself on your own two feet? Water will be provided once on each lap of the course and at the end of the race. Medal for all finishers, including the family fun run! Overall 1st, 2nd, 3rd man and woman trophies. Age group prizes in in 10 year bands. The family mile is one loop on forgiving terrain. The course is on wide country paths which are very close to event HQ. The course is suitable for buggies and dogs. We want the whole family to get involved! The race starts and finishes at the beginning of the bike course near the café. Each lap is relatively flat for the first mile, but is positively undulating for the remaining four. The course is on wide and well maintained public footpaths which meander through the Park. 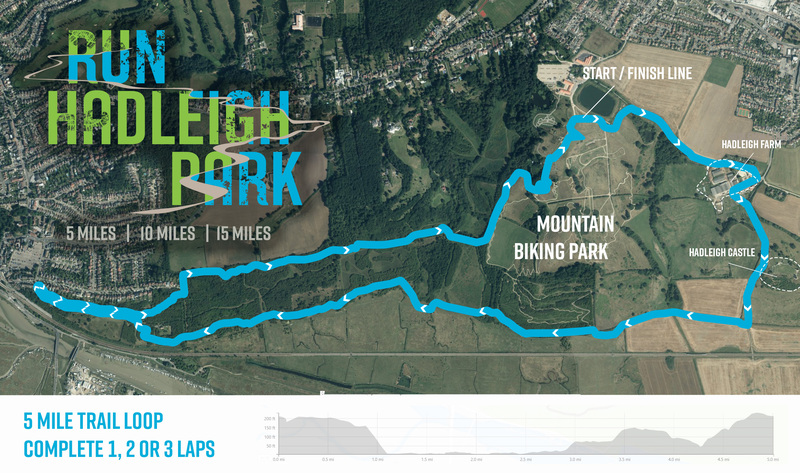 Run Hadleigh Park has a maximum time restriction of 180 minutes, which equates to 12:00/mile pace for 15 miles, after which there may not be marshals and time keepers available.